Is your little sweetie getting sick of life on the shore? Does she crave the open ocean, salty sea air, and cry of the gulls? Is she dependable, hard-working, and not prone to motion sickness (this is important)? Does she look cute as can be in a uniform? Ahoy! You have a little sailor on your hands! 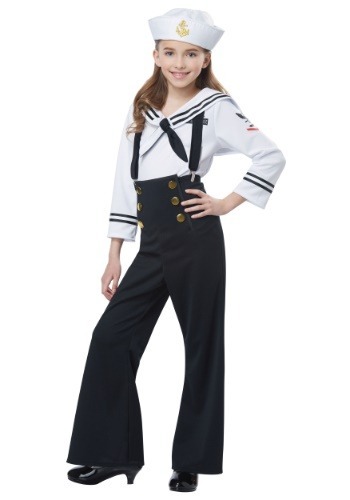 You may think she's up and joined the Navy when she struts around in this Girl's Sailor Costume! And would that be so bad? She'll get to satisfy her need for thrill and adventure all while learning the benefits of hard work and perseverance. Of course, if you're not quite ready to part with her on a mission just yet, this costume is cute for trick-or-treating, too! She is a sailor at heart, so embrace her passion for pushing off from shore now and you'll always be her first call upon arriving back at port. This is a classic sailor ensemble with high-waisted pants, suspenders, and a keenly-styled shirt. The white top features stripes in all the right places, a sailor collar, and a printed emblem on the arm. In case there was any question, the anchor-printed sailor cap finishes off the look and may just leave her as speechless as the wonders of the ocean! She definitely looks like she's got her sea legs now! She's growing up so fast! But not to worry—she's not ready to enlist just yet. Before she sets sail, you still have many years of watching her roam house to house in her cutest costumes and then devour her Halloween candy. And at least you know she will always come back to celebrate Halloween with you—we're not experts, but we imagine that it's mighty hard to trick-or-treat on a boat at sea!